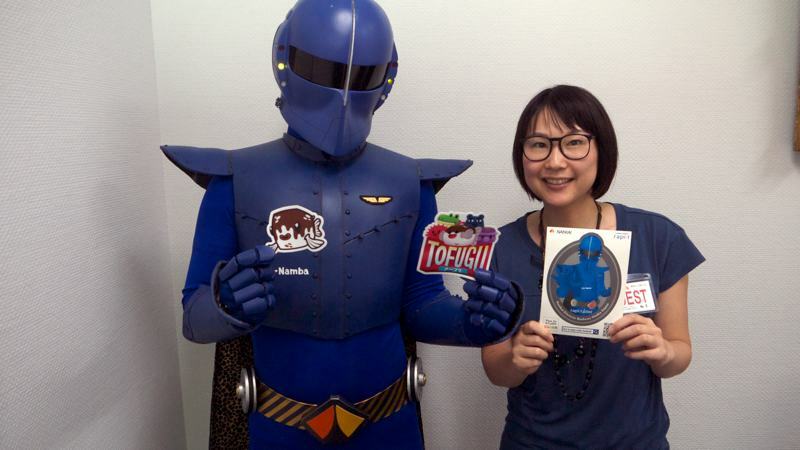 I never expected to meet a Japanese superhero. We were both at the Tsutenkaku, a famous tower in Osaka, though our goals were completely separate. 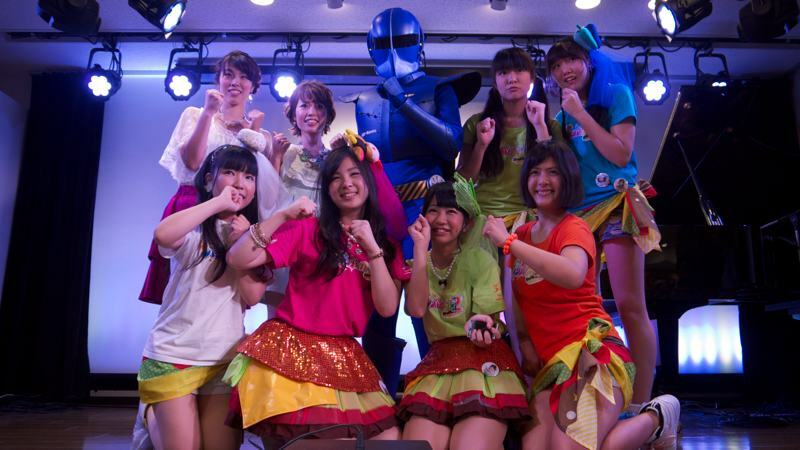 I was there to learn more about the life of an idol otaku by watching a show by Hamburgirl-Z, a local idol group. The superhero was there to shake hands and meet his fans. Between shows, they stood together so I could snap a picture. As I watched our blue suited hero interact with fans and pose for pictures, it dawned on me. I had seen him before. It was in a YouTube video that I came across while doing research for another Tofugu article. Trust me, you'll want to watch this. As one YouTube commenter so aptly said: "This is officially so bad that it's good." Between shows, I walked up to the Rapi:tldier and gave him my business card. I told him I might write about today's event. We chatted a little bit, and I promised to show them the article when I was done. That night, after I arrived home, I opened up my laptop. Waiting for me was an email from the Rapi:tldier team, saying they were looking forward to the article. I replied to ask if it would be possible to conduct an interview with the Rapi:tldier himself. "Of course!" they replied almost immediately. We scheduled a time for the meeting and I began my pre-interview research. 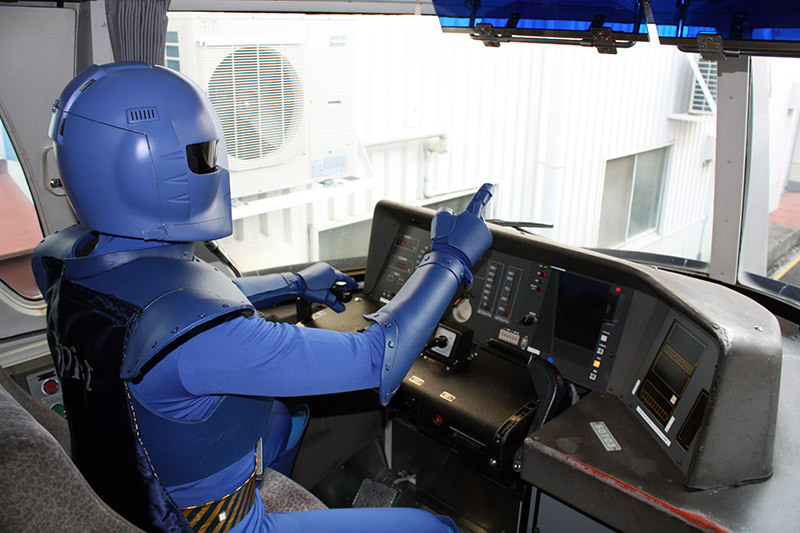 The Rapi:tldier is a ranger-esque super hero modeled after the Rapi:t Train Line in Osaka, which runs between the Kansai International Airport and Namba Station in Osaka Japan. Apparently, "Rapi:t" comes from the German word for "rapid." It looks like this. That retro-style design won Wakabayashi Hiroyuki the Blue Ribbon Prize in 1995. If you are in the Kansai International Airport (or need to go there) you can reserve yourself a ticket and ride it. 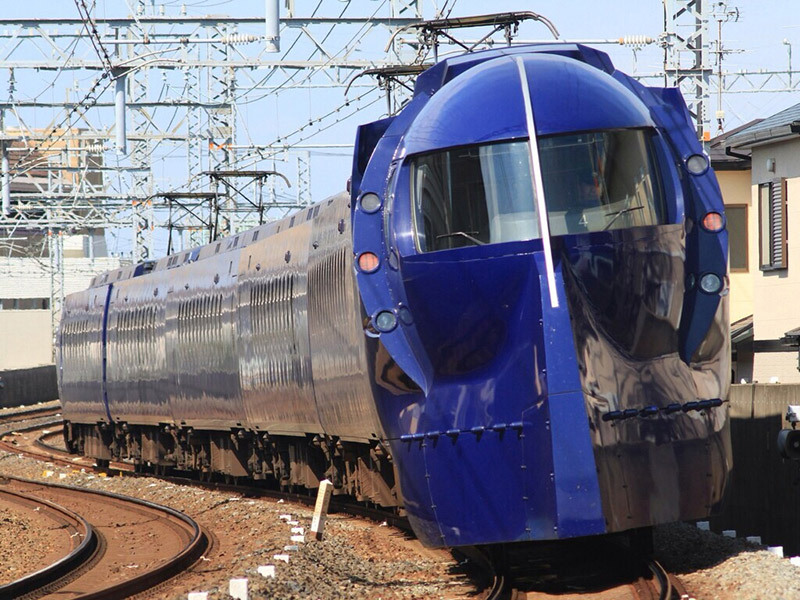 Our superhero friend, the Rapi:tldier, is based off this train. I'll let him explain his design in more detail when I talk to him, but I think you can see the similarities, especially in the helmet. I read up on the infamous video as well. When the film was in its planning stages, there was a shared vision regarding the quality of it. It was intended to be great. But after its release, the video became famous for the opposite reason. "While our video quality is low, our hearts and spirits will never be beaten by anyone. We are really passionate." And, they brought that passion to the interview as well. It was two weeks after the Tsutenkaku Tower event, where I originally met Rapi:tldier. I was told I should come to the Nankai Electric Railway headquarters for the interview. I gave my name at the front desk, and the receptionist gave me a floor and office number where Rapi:tldier waited. Faced with such formality, I expected the person waiting for me would be dressed in suit and tie. 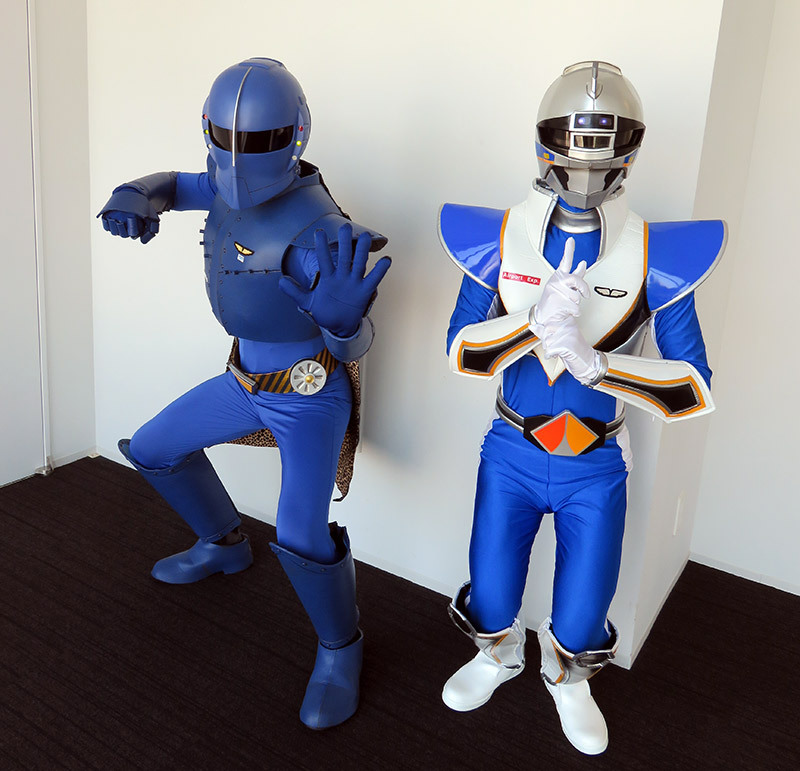 But, upon entering the meeting room (which was amusingly labeled "The Osaka Secret Police Office") I saw Rapi:tldier in full costume. 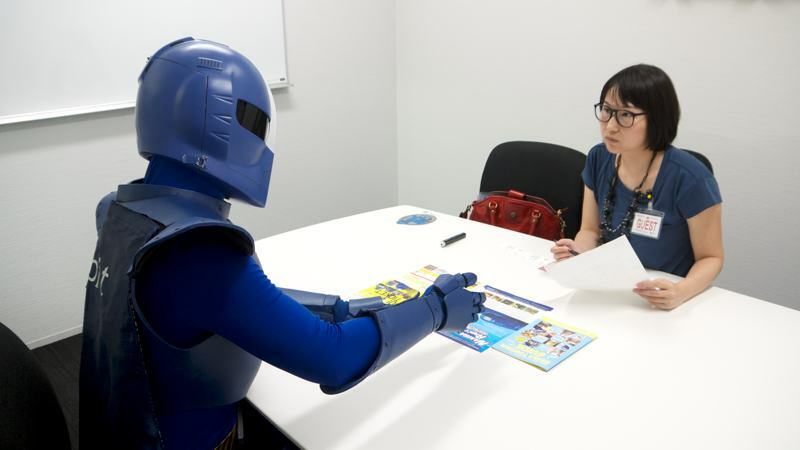 He had come to the interview wearing his complete ranger suit. He was sitting next to the supervisor of the Rapi:tldier team. I made sure to snap some evidence that I was actually about to interview the Rapi:tldier himself! It felt like my smile was attempting to leap off my face when we did our introductions. I was so surprised, and a little giddy, that Rapi:tldier had chosen to wear his suit. After our konnichiwas were complete, we sat down at the table. In a Japanese-style meeting, the seat of honor is the seat closest to the alcove, called the toko-no-ma 床の間（）, while the less desirable seats are those closest to the entrance. This custom still remains in Japan, especially in business, and customers usually sit down in the seat furthest from the door. Thus, following the formalities, Rapi:tldier encouraged me to take the seat of honor. What a gentleman! It was at this point when I recognized that I had been granted something special, and I knew this was going to be an interesting experience. Making sure they were aware of my appreciation I said, "Thank you so much for this interview opportunity today." Then I quickly added, "and also thank you for safe-guarding Oasaka for all the tourists." Rapi:tldier's facial expression was indistinguishable behind his mask, but to me it seemed like he smiled a bit. "So, could you tell me your story? How Rapi:tldier was created?" I asked. Rapi:tlder looked at his supervisor and calmly nodded. At first I thought this was for permission to speak, but it was the other way around. The supervisor turned to me and explained in Rapi:tldier's stead. 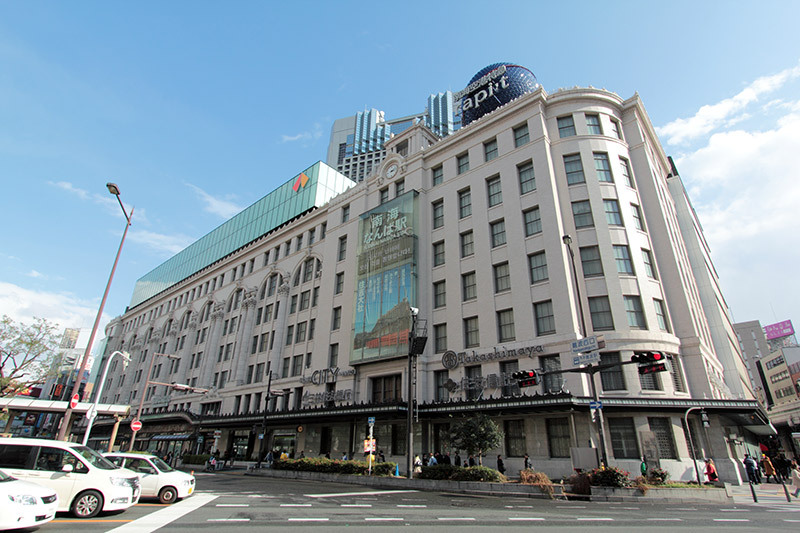 "At the end of last year, the evil goblin Gokibler arrived in Osaka to conquer the world using this city as his central hub. Thus, the Osaka Secret Police (a.k.a. 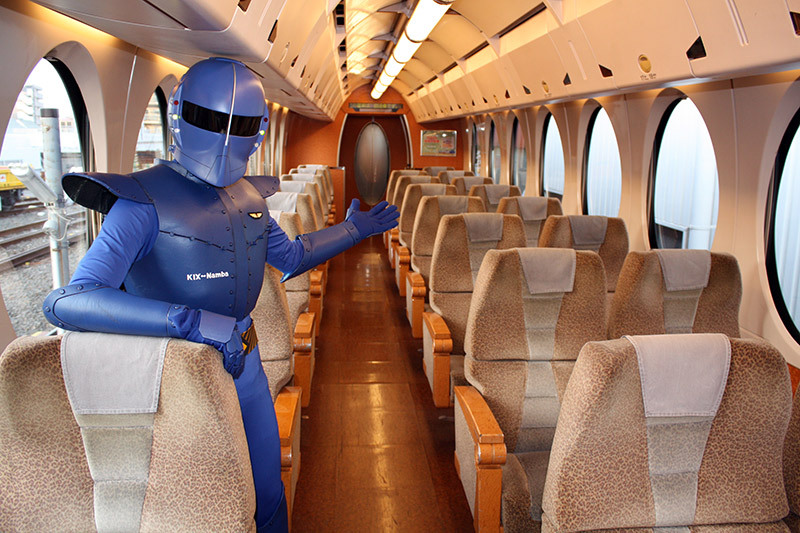 the Nankai Electric Railway) developed a cyborg soldier, Rapi:tldier, to defeat the goblin. Our team started making Rapi:tldier in November 2014. It took us three months and he was finally unveiled on February 16, 2015." 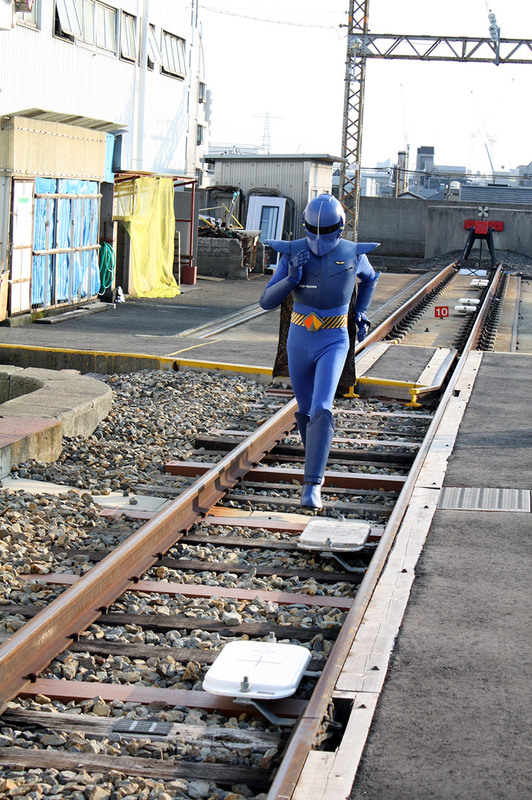 Rapi:tldier the Japanese superhero with Rapi:t his trusty train friend "It only took three months?" I wasn't sure if they were referring to how long it took to design the character, or if they were still telling the story of a cyborg's creation. "Yeah, and at that time we, the members of the project team, were so incredibly busy," the boss replied. "We even had to get permission for his look from the Rapi:t design team." Seems like he was talking about designing the character. "As you can see, he is the representative hero of our train Rapi:t. The pattern of his cape is the same as those on the Rapi:t seats. The design of his belt is the same as the necktie of Nankai Electric Railway staff. The buckle bears the company logo. And his face resembles the train engine itself. However, we don't own the rights to the appearance of the train. The original designer does, so we needed his permission." "How did you come to design your hero the way that you did?" I asked. "Actually, Rapi:tldier was originally given a mouth. 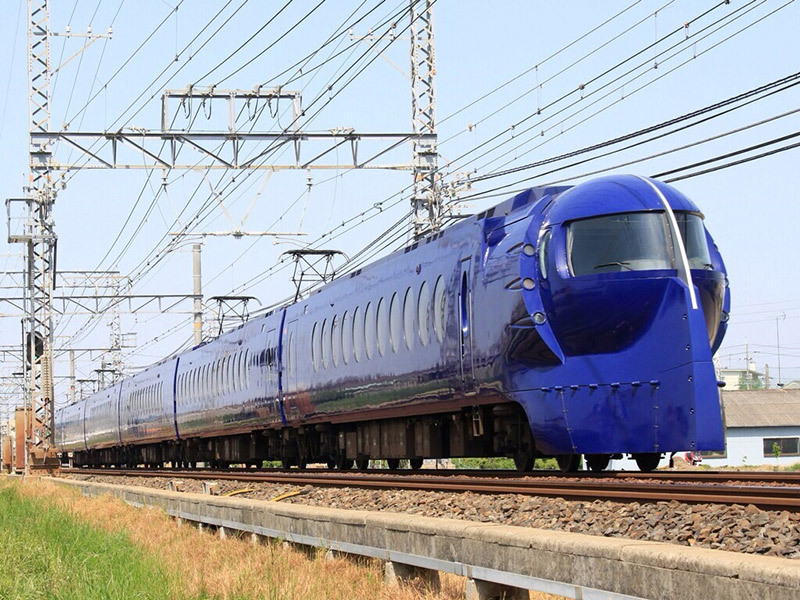 The Rapi:t train is dark blue and, to us, that seemed like a color more suited for a villain. So I wanted to add a smiling mouth to make him appear friendly. But unfortunately that idea was not accepted by the designer and we had to remove it. It wasn't as big of a problem as I had originally felt it to be because Rapi:tldier wound up being cool looking anyway. In a way it's good," he said while tapping Rapi:tldier on the back, "…because at least now he doesn't have to worry about eating food. You see, all of his energy comes from batteries." He looked kind of proud about this fact. I considered taking bacon out of my purse and eating it in front of the Rapi:tldier to see if he'd take his helmet off out of hunger but decided against it. Although Rapi:tldier doesn't have a mouth, he is still able to speak. In the video, you'll hear him confirm orders by saying, "Roger." He also talked to me in the interview, of course. When I asked what kind of things Rapi:tldier actually does, Rapi:tldier quickly chimed in. "I protect the security of Osaka and keep it peaceful so that tourists can travel around Osaka without any worries!" he said, striking a heroic pose. The Rapi:tldier team belongs to the Tourism Department of Nankai Electric Railway, so he was created for the benefit of tourists that come to Osaka. He even appears at tourism events in countries other than Japan. Rapi:tldier told me that's why he learned English, as well as greetings in other languages for when he goes to non-English speaking countries. 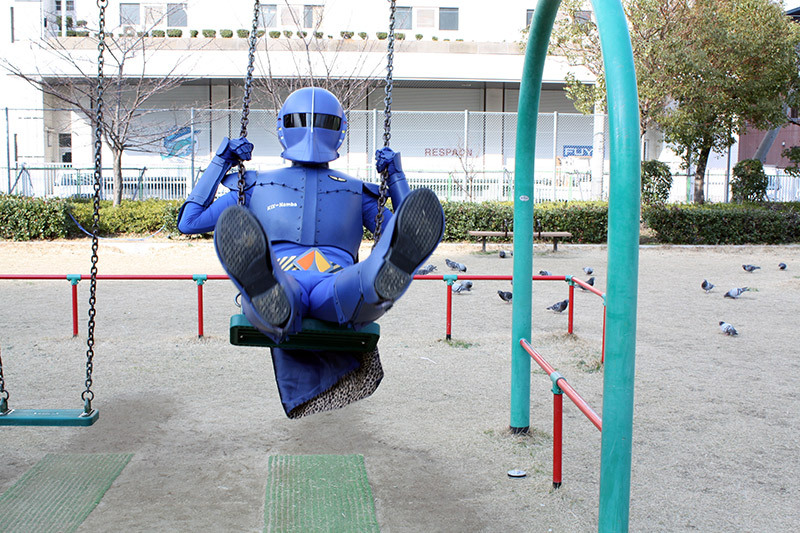 When not touring the world, Rapi:tldier patrols Osaka and also introduces great sightseeing spots to people in need. If there's an incident, he takes the Rapi:t train to get there and he never forgets to buy a ticket either, as seen in the video. You'd think that his superhero status would come with some perks. "So you are like a PR officer for tourism, then?" I suggested. Rapi:tldier nodded his head in approval. But he also thought it was important to clarify that his main priority is to keep Osaka's peace and protect it from the evil goblin. Another heroic pose, this one from a sitting position. "And you have allies that assist you in your efforts to maintain the peace?" I added. "I saw them patrolling alongside you in the video. Could you tell us about them, too?" He continued, "Actually, all the actors and actresses in the video work in this very building. We couldn't get enough people to take part, so some people played multiple roles, some of which aren't seen in this picture. 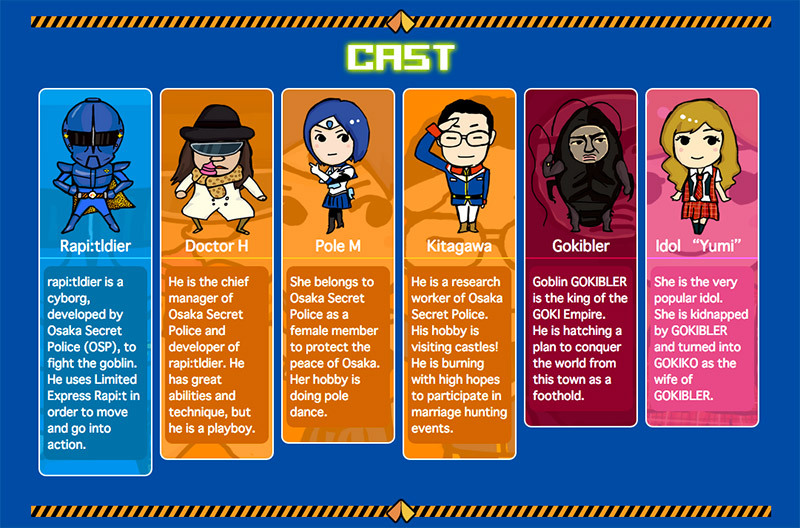 "Doctor H is another supervisor at Nankai. Pole M was named after her hobby in real life, pole dancing. She is actually an amateur pole dancing champion. Sometimes there are personnel changes at the company and, sadly, Idol 'Yumi' is no longer on our team." I offered my sympathies by saying, "That's too bad. She seemed to be an important person in the story." He nodded, shrugged his shoulders and said, "Well, there's not much we can do about it now. Like Snoopy once said, 'You play with the cards you're dealt,' right? From that point on, we put forth all of our effort." I didn't expect a Peanuts quote. "When a door closes, a window is opened. If someone leaves, someone new will come. There are new characters in the second video and they might appear more in the new videos, so please watch for them." "I look forward to it!" I excitedly replied. And I wasn't being sarcastic. I was really moved by their passion for their films, but I wanted to learn more about the people themselves. "You said you'd put forth all your effort, but what is it that Rapi:tldier actually does out there?" I asked. Again Rapi:tldier took it upon himself to answer. "First, I exercise everyday to keep myself healthy." "Oh, you mean that exercise?" I said knowingly. At the Tsutenkaku Tower event, I saw Rapi:tlider do an exercise called "Nankai Taisou." "That's right," he replied with gusto. "I love Osaka, but my health is the most important thing for me if I want to keep guarding its people." He said all this with a seriousness that we couldn't help but find funny. We all had a good laugh. "All kidding aside," the supervisor said, "Rapi:tldier does work out and sometimes we post the pictures on Facebook. 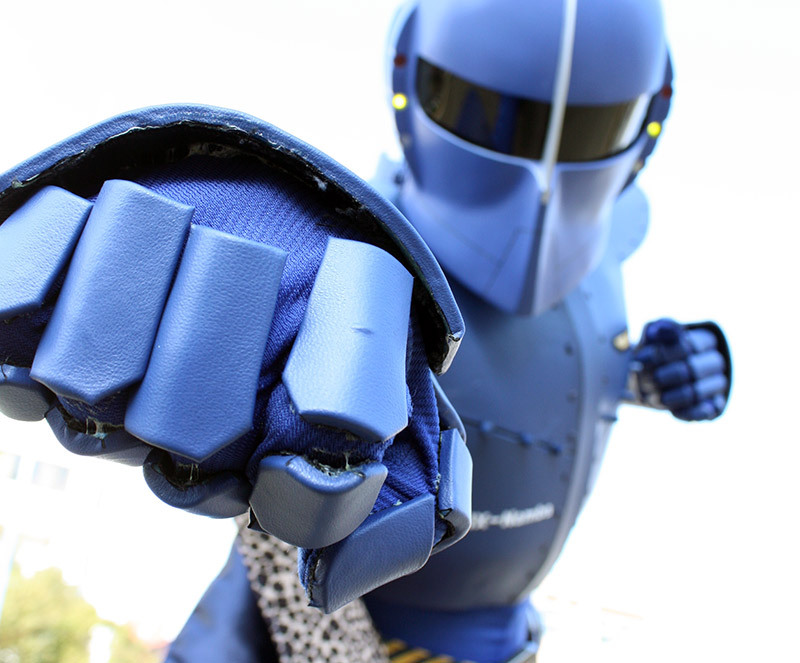 We want to tell children that Rapi:tldier is strong not only because he's a cyborg, but also because he puts in a lot of effort to better himself. After all, we are just ordinary workers and can't do somersaults or other cool tricks. But if we exercise and work hard, we'll be able to do them in the future." "Very good. So you also try to convey a positive message to children. What about special powers or abilities? Does he have something like that?" Rapi:tldier piped up again, "I'm good at sword fighting with my electric sword. 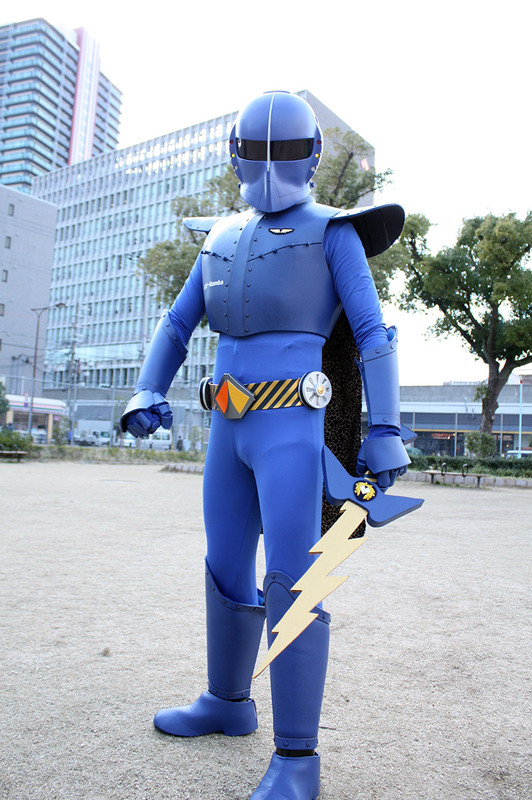 I do shinken-shiraha-dori 真剣白刃取り（） too," he said while waving his lightning bolt sword around. "I also have a 'wheel cutter' which I throw like a shurkien. On top of that, in the video you'll see me doing a lot of pro-wrestling moves against Gokibler's henchmen." "So, you are training hard to become a better hero, but are there other heroes you try to emulate, or do you have rivals that you compete with?" I asked. The supervisor fielded the question this time. "We went to the Robot restaurant in Tokyo to study. But we wanted Rapi:tldier to be unique, to be the one and only hero of his kind. So we intentionally avoided emulating other heroes. "One rival, perhaps,is Inunakin from Izumisano Osaka. He was created by the manga artist behind Kinniku-man, Mr. Yudetamago. We happen to be good friends with him. We meet at events from time to time and we learn from each other so we can progress. "A really big rival, however, is Kumamon. As you probably know, there are so many mascot characters called 'yurukyara' in Japan. Nankai Electric Railway actually has its own mascot character named Rapi:t-kun, but it was difficult for him to stand out among all the other mascot stars out there. 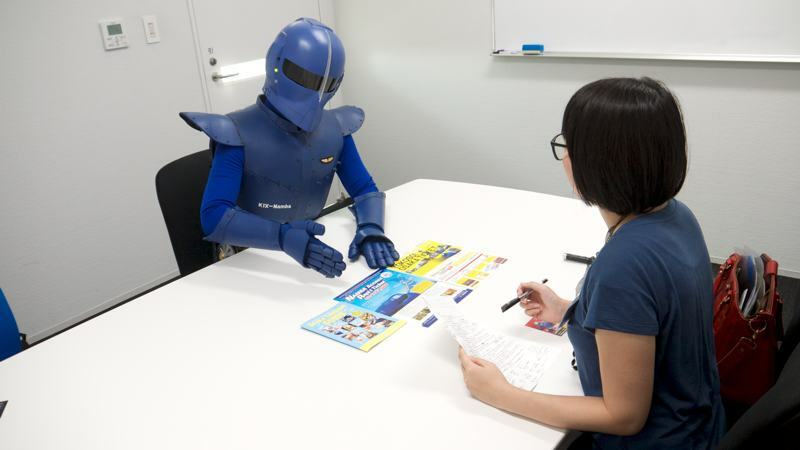 "Most yurukyara are really cute, so we wanted to steer clear of that when creating Rapi:tldier. In that sense, the true rivals of Rapi:tldier are those yurukyara, and so our truest rival is the king of yurukyara – Kumamon!" Kumamon is such a cute mascot. With Rapi:tldier being a cool, fighting hero, it sounds like a mismatched rivalry. I shook my head out of the bizarre day dream and got back on track. "Are there any stories you've never told anyone?" I asked. The supervisor nodded. "Well, this part is not a secret, but Nankai Electric company used to own a baseball team, called The Nankai Hawks. They are the Softbank Hawks now, but there are still old fans of that team and Rapi:tldier is one of them. Every once in a while, The Softbank Hawks pay homage to the former team by playing a game in the old Nankai Hawks uniforms. We are hoping to one day throw the opening pitch at one of those games." He leaned forward with a small smirk. "Now this is the secret part: we secretly put the Nankai Hawks logo on the back of the Rapi:tldier helmet." The supervisor seemed pleased to finally confide in someone. "An opening pitch," I exclaimed, "would be fantastic, wouldn't it? Tofugu loves baseball and I bet that my boss and coworkers would love the story! What about stories related to the actual filming of the video? Anything worth mentioning there?" I asked. "Well, the first video was actually shot during the winter," the supervisor began. "But the story was meant to take place in the summer. In one of the scenes, we're all shown eating soft serve ice cream, but it was so incredibly cold that day. You'd never imagine eating ice cream to be a form of torture," he joked. "On the other hand, being inside the Rapi:tldier costume can actually get really hot, especially when we are shooting a running scene. The helmet's visor fogs up when eating ramen, so he could barely see in front of himself. He had to rely on his instincts to avoid running into Osakans while shooting those scenes," he said with a hearty laugh. "What else…?" he pondered. "Oh, at the end of the first show, there is an epic fight scene. One of Gokibler's underlings is actually 'Pole M.' Remember, I mentioned earlier that she is an amateur champion in pole dancing? So I thought she would have excellent reflexes and would be perfect for the 'ippon-seoi' (a one-arm grab, over the shoulder throw) stunt. She hit her knee really badly on the ground and got a really nasty looking bruise. God, I felt so bad. Poor Pole M. She's fine now though," he said with a disapproving shake of his head. It was evident he cared for his coworkers. I cringed and clenched my jaw. "Ouch! That sounds so painful!" Finally I got to the question I'd been dying to ask. I was ready to find out what all this Rapi:tldier business was about. "Now that we've all learned about Rapi:tldier, his birth and his secrets, I have to ask, what is your ultimate goal?" I questioned. The supervisor leaned forward placing his elbows on the desk and said, "The goal is to conquer the world." Even Rapi:tldier himself was taken by surprise, "What? Conquer the world?" the blue hero asked. In that moment I could see Rapi:tldier's internal programming struggling to quantify this statement. I almost expected him to say "does not compute" and blow a circuit. But what is a cyborg to do when he realizes that his supervisor is actually the enemy? The supervisor quickly snickered, "Nah. Just kidding. Our goal is to make people want to ride Rapi:t. Right now, the train is just a way of getting around. But we want the train itself to become the reason why people ride it." It's a good idea, I thought to myself. "So you want to make the train one of the attractions that people make a point of seeing when they go sightseeing?" I asked. "That's right. Like Rapi:tldier himself, the train Rapi:t is also really unique. It's filled with things that represent the spirit and culture of Osaka. For example, the design of the seats are all leopard skin pattern because Osakan oba-chans (middle aged women) tend to wear animal patterned shirts for some reason. There are also vending machines inside and spaces for wheelchairs," he added. 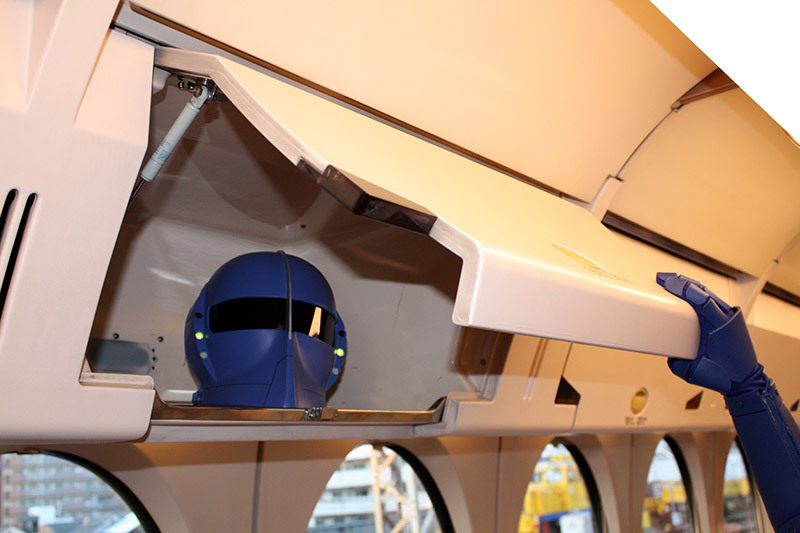 "We also have overhead compartments for storing luggage, like airplanes do," the supervisor continued. "And all 252 seats on the train are reserved, so you can travel really comfortably. If you want more luxury, there are super seats available for an extra fee," he mentioned. "That's cool," I remarked. I told him that I flew in to Kansai airport because Air Canada started a new flight to Vancouver. But I didn't use the Rapi:t because my parents came to pick me up. I wish I could have. "Well, you still could," he stated happily. "Like I said, that's our goal. We want people to ride on Rapi:t for the joy of it, and not to just use it as a way to get around." I still haven't tried Rapi:t and I feel bad. But I'll definitely try it the next time I go to Japan. As for the details of Rapi:t's awesomeness, please check out this site and Rapi:tldier will guide you. And Nankai Electric Railway is really welcoming to foreign tourists. They installed a prayer room for people from the Islamic community who visit the station. It's the first one among all the stations run by Osaka's railway companies. "Thank you so much for the interview," I remarked. They both stood up and said, "You are very welcome," at the same time. "Before we leave…," I pushed, "I have a final question: do you have a message for the Tofugu readers?" Rapi:tdlier beamed through his mask, "I'm going to work hard, so please root for me! I want to be a world renowned hero." His supervisor went next saying, "We have a Facebook page called 'Rapi:tldier Mania.' We use it to interact with fans. So, please, check it out, like it, and post whatever you think about Rapi:t, Rapi:tldier, or Osaka. "Also, there are hidden jokes in the Rapi:tldier videos. For example, if you look at the amounts listed as the rewards on all of the wanted posters, they are so cheap, except for one. There are a lot of boke ぼけ（） in the Rapi:tldier series and I want you to find them and post them on our Facebook page as 'tsukkomi.'" For those who don't know, "boke" and "tsukkomi" are a Japanese comedy terms. "Boke" refers to jokes or a funny person who makes jokes. "Tsukkomi" refers to the person who reacts to boke jokes. It's very similar to the "straight man/funny man" concept in Western comedy tradition. "Okay, great!" I said. "That sounds like fun! Thank you so much for today!" I concluded. Rapi:tldier and the supervisor escorted me to the elevator. As the doors were closing, they both bowed and wished me a fond farewell, a politeness I'm sure people will experience if they ride on Rapi:t. Thanks for a keeping a watchful eye on Osaka for us, gentlemen.